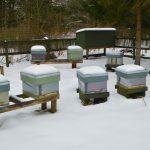 Why is the current weather a perfect storm for the winter bees? The current cold spell is hitting the winter bees with a perfect storm of hardship. There are three major reasons this is bad timing for them. They have survived the winter so far by clustering and using up their stores of honey. This includes their internal stores of nutrients, called fat bodies. At this stage all these stores are getting low. They have started taking in pollen in the last week or so. The means the queen has started laying again. The colony will have been raising the brood nest temperature by 15 degree C and will be feeding the young larvae. This is quickly using up their remaining stores of honey and consume precious internal resources. The number of larvae in the colony may well exceed the number of workers trying to keep them warm. This is normal at this time of year. It is a calculated risk the colony takes to produce the first brood of the season as early as it can. Then they hit a cold snap of minus 4 degree C, with snow. This might have been dealt with by the bees in the middle of winter by clustering tightly and sitting it out. Once resources are committed to brood rearing the consequences are more severe. 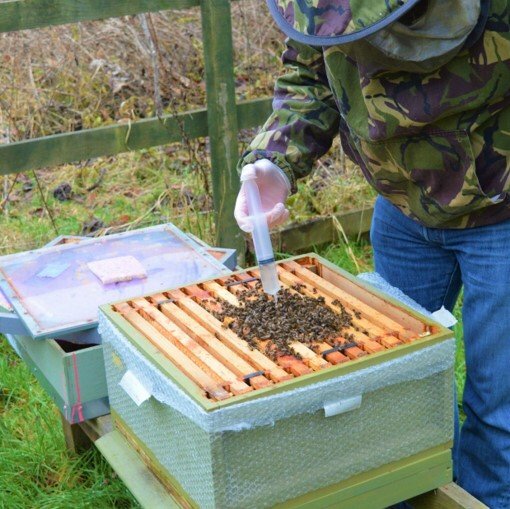 How might the winter bees react to this spell of cold weather ? In response the winter bee colony may form a smaller cluster to keep warm. As a result some brood may be become “chilled brood” and the cluster may become out of contact with its stores, creating “isolation starvation”. The colony will have put a great deal of resources into this first batch of brood. If this fails they can not get these resources back. There may be more dead bees to deal with and entrances may become blocked. 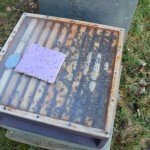 What can I do to help the winter bee colony survive ? 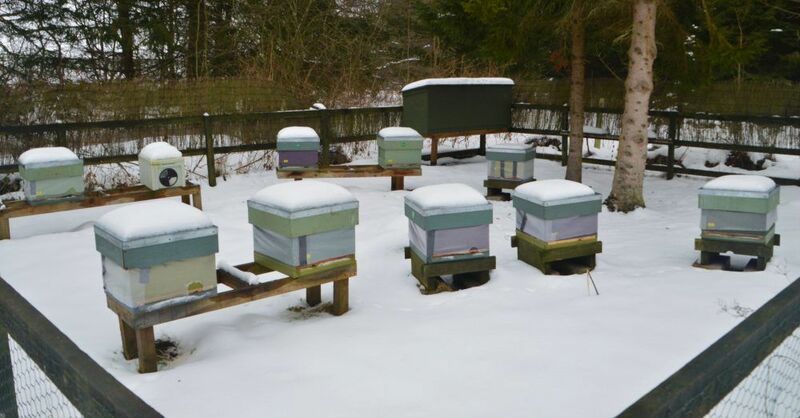 It is a bad time to disturb them while the snow is on the hives and they are trying to keep as warm as possible. My priority is to be ready to make sure they are not starving as soon as I can safely check on their stores. There is not a great deal more I can do for my colonies, at this stage, to get through natures toughest of survival tests. They will be dependent on their own resilience to these conditions and my preparations for them going into the winter. My key aims for winter preparation were to ensure the colony. Had enough stores to last the winter and early spring. Was insulated to keep heat in. To be free of pests and disease. The preparations I carried out in the autumn were. Feeding with strong sugar syrup (60:40) solution, including the addition of Thymol. This was added to prevent mould growth in the syrup. Beebase has a useful guide on feeding which includes using Thymol addition. Hives were fitted with perspex crown boards, bubble wrapped and two layers of 12mm foam underlay. The foam underlay was fitted under the roofs in a 25mm eke. Entrances were reduced to 25mm x 6mm. 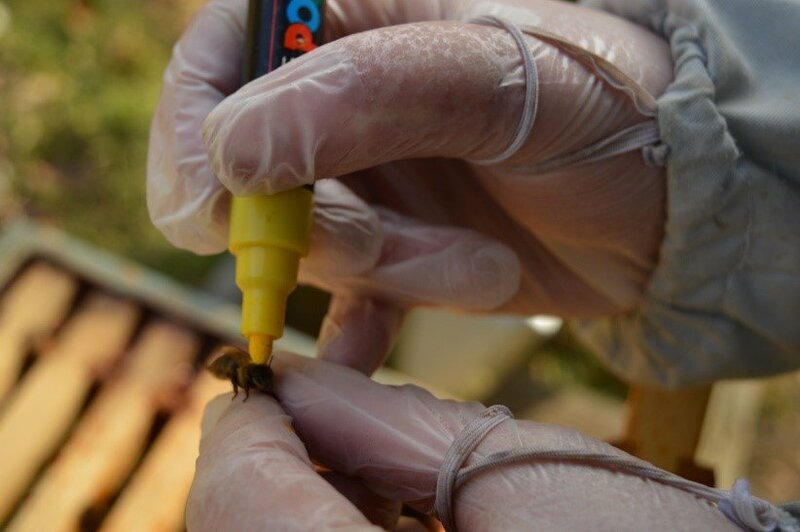 Oxalic dripping treatment at the turn of the year, on a day that reached 10 Degree C.
Fondant was added, directly above the cluster, in each hive during February. 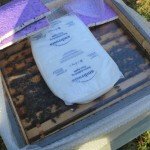 What can I feed my winter bees to stimulate them in spring ? As the bad weather clears I will be making up some 50:50 sugar syrup solution to give them at the earliest opportunity. 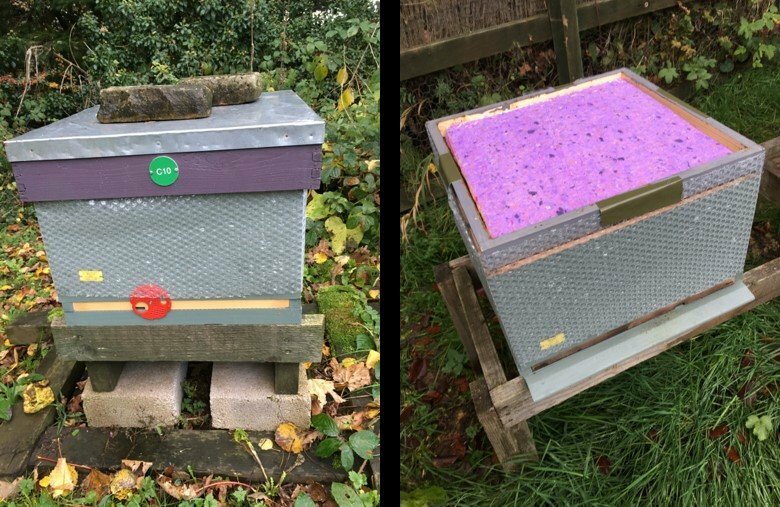 The thinking behind this is to stimulate the surviving winter bees into the spring of 2018 by giving them a source of energy to do the work of raising the temperature of the brood nest and foraging for pollen. Snow drops and gorse are a good source of pollen in rural Northumberland at this time of year. Many beekeepers, particularly in areas with little forage for the bees at this time of year, advocate the use of a pollen supplement or substitute. This is commercially available under a few different brand names from people like Thornes and Paynes Bee Supplies. Again, beebase has some guidance on a recipe for this for making your own. In Yates’ revision notes for BBKA module 5,6,7,8 book, they describe a recipe. three parts fat free soya flour. mixed with 2:1 sugar syrup. made into a patties and put into plastic bags. I have not tried this out, mainly due to difficulty finding fat free soya flour in less than industrial quantities but also feedback from two different commercial bee farmers, at different ends of the UK, that their experience is that the bees do not appear interested in it. All the best for your winter bees, I hope they do OK in these harsh conditions and standby with the feed. As for winter beekeepers, its time for hot chocolate and big coats. Nicely written – the people of Northumberland or is it Northumbria are lucky to have such a resource.